This recipe is adapted from an Apple Nacho Recipe I saw in a recent Taste Of Home magazine. However, I really adapted the recipe and made it much more simple. The original recipe had you making your own caramel sauce, which you could do, but I took the easy way out and opened a jar of caramel topping and my kids never knew the difference. My family loved these. It is really not a recipe, especially once I omitted the homemade caramel sauce. This is really one of those things you can just adapt. Add the toppings that you want or take off the ones you do not want. This is also a great dish or snack for kids to make. It is so easy and they will feel like they accomplished a lot. Not only that they love to eat the results. 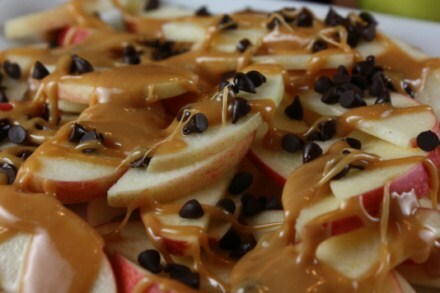 Place apples on a plate or platter, top with chocolate chips, and any other toppings you choose. Drizzle caramel topping all over. How fun! I always do dipped apples but these look much tastier! What a wonderful idea! And pretty healthy too! Thanks for sharing! how do you keep the non covered in caramel apples from turning brown if you did this for a party ? @s, You might try slicing the apples first and tossing in just a little bit of lemon juice. That sometimes helps them from turning as brown. But you still could not let them sit out for too long. I’ve done these both ways, and I have to admit the Taste of Home version is A LOT better. You aren’t making your own caramel sauce, you are simply melting caramel candies and making a marshmallow drizzle. I highly recommend going a few extra steps with this recipe…it won’t disappoint. This way is just a little too runny and somewhat tasteless. Could you share the original recipe? Thanks! Yum! I did this with caramel sauce the other day and it was so good! 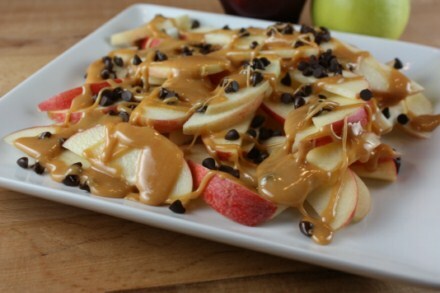 Great idea to add choc chips or raisins!